In an attempt to bolster up my outlook on HUI that I posted earlier this week, I am presenting a few individual gold stocks that demonstrate a variety of chart patterns that are very suggestive of an imminent breakout to follow HUI in to higher prices. The individual stocks shown below are mere examples, not recommendations. Yamana (AUY) Daily chart shows a very ambitious forecast that suggests the possibility of AUY screaming much higher with a target of $6.85 by the end of the year. The fact that the HUI forecast is for a much shorter timeframe is rather problematic, so at least for the time being I am only looking for a near-term target of around $3.50. As we get closer to HUI's target timeframe, I will try to re-evaluate AUY -- HUI and AUY should be exhibiting similar forecasts. The accompanying 60 minute chart shows that AUY may have already broken out above the upper downtrend line. This provides a zoomed-in view of current activity which suggest that, in the event AUY has indeed broken higher, then the red line that was previous resistance should now convert to a support line. This means any weakness tomorrow or next week should stay pretty close to this line and not too much below it. Brief intra-day jabs below the line are acceptable but a end-of-day close well below this line is not good for this otherwise bullish forecast. A break below the lower red support line (currently around $2.30) would be an indication my forecast is wrong. So we have a possible 24c range (-9%) for loss from current price to gauge reducing exposure or perhaps even a total unwind of the position. But I think this risk/reward looks pretty good. 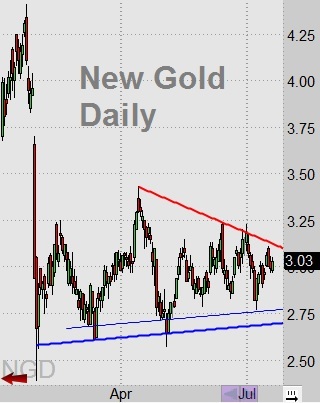 New Gold (NGD) is also showing an overhead resistance line and has not yet been able to overcome it. So NGD needs to be monitored to see if it can indeed break out above this line. Klondex (KLDX) actually looks like it is already well on its way to higher prices. It is not restricted by an overhead resistance line, at least not to the extent of the other stocks presented here today. From its low I have labeled (red) 1-2 followed by a lower level (blue) 1-2. 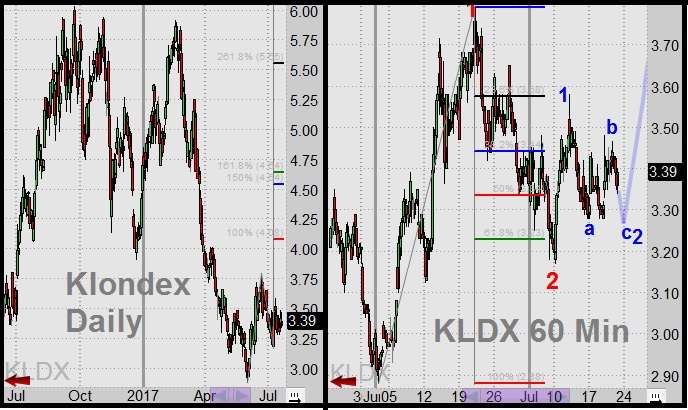 This later 1-2 appears to be incomplete, so I would not be surprised if KLDX trades for an hour or two below $3.30 to complete that little (blue) "c" of "2". The initial minimum target for (blue) wave 3 is $3.90 - $3.95, and further out the (red) wave 3 target is $4.54 - $4.64. An alternate EW scenario would be a pattern similar to what I presented for HUI, in which case the forecast would also fall into the $3.90 - $3.95 area. Primero (PPP) has shown very extreme weakness throughout the whole GDXJ Rebalancing ordeal. Well, actually, it has been very weak since its 2014 high $8.47, and then last year's high in July at $2.63. The GDXJ Rebalancing was not responsible for any of that, except perhaps for the drop from about $0.63 in April, 2017. Primero has its own business issues that caused much of that severe price drop over the past several years, but I think the selling has been way overdone. For what Primero business is today, I think there is some good value at current prices. The 60 minute chart shows that the price appears to have broken out above the overhead downtrend/resistance line several weeks ago and is showing fairly decent strength lately. The pattern I think is most likely to play out in the very short-term is a head & shoulder pattern, where the "head" is the dip down below $0.333 since the start of July. The "left shoulder" is the area highlighted by the red horizontal support at about $0.335. So the "right shoulder" may play out as the price weakens for two weeks to fall back into a range of about $0.335 to $0.355. But I could be wrong and PPP may be similar to KLDX in that it could move impulsively upward. PPP will encounter heavy resistance at $0.40 and then again at $0.445. If over the next week or so, PPP fails to fall back into the "right shoulder" scenario, then I would conclude that a more bullish pattern is more likely in play here. 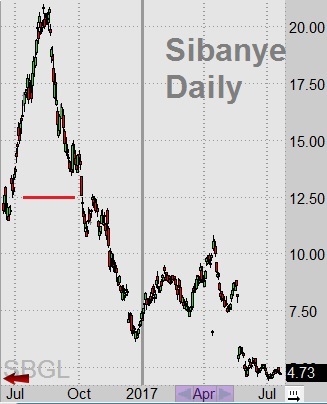 Sibanye (SBGL) is currently undergoing some rather intense labor & strike issues with its mine in S. Africa. Furthermore, it spun off a bizarre dividend earlier this year. It is imperative that anyone interested in investing in SBGL stock at current prices be cautioned into adjusting the stock chart to account for this dividend. In other words, if you are attempting to drive forward with SBGL by looking out the rearview mirror at it previous high price, you need to dramatically temper that previous price by the effect of the dividend - roughly all prior price activity needs to be reduced by about -40%. In the SBGL daily chart I drew a red line approximately where the August, 2016 high should be viewed, as adjusted by the effect of the dividend. That said, SGBL appears to offer some good value at current prices. The 60 minute chart shows that it may have already broken out above the (red) downtrend resistance line, and has since been bouncing lower along that line as if it is now a support line. 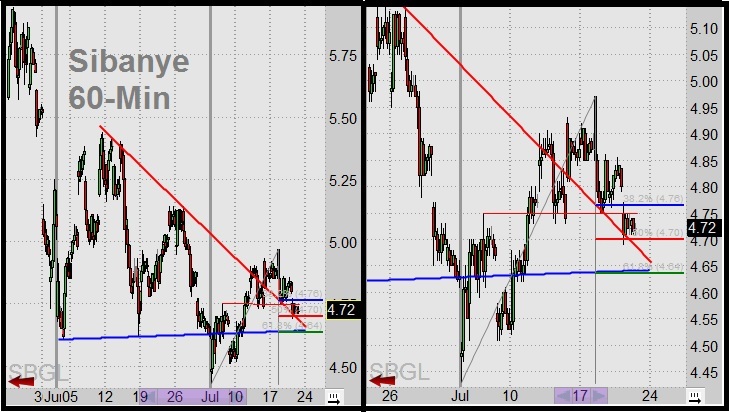 The 50% retracement is $4.70 which is where SGBL is today, but 62% would take it down to $4.64. Notice the (blue) support line, which when carried forward of the early July weakness, suggests possible additional support at $4.64. Therefore, I suspect SBGL may remain weak for another day or two, testing the (red) support line as well as the (blue) line. So I am expecting to see SBGL begin to move higher and go above $4.95 before the end of next week. If I am wrong and SBGL price tanks significantly lower from here, then the downside is very limited before scaling back or dumping the current position. A big closing break below $4.64 is a bad sign and certainly if retesting previous lows at $4.44. This presents as a worst-case scenario loss of only -2% to -6% from the current price -- which is a pretty good risk/reward. If SBGL can gets its business act back in control and begins to follow the HUI trend, then I think we could see SBGL re-test the breakout (lower) high just below $6.00. Anything above that is way too speculative at this point because the chart history has been severely damaged for analysis purposes. So that just means we have to play it by ear and try to gauge each move using EW. So far I think SBGL is showing a wave "1" high at $4.97 and the wave "2" is currently being played out. This wave 2 could be done already but I suspect we will need at least one more jab lower - like I said above, probably tomorrow or very early next week.